Chickens are funny creatures. First you have four. Then, suddenly, you have eight. Before you know it, you're up to 12 (give or take a rooster). Now, as of Easter Sunday, we've got 17. Yup, we expanded our flock yet again. But really - can you blame us? Believe it or not, Nathan was the one pushing for new chicks this time. We got our last little ladies two years ago, and Polly, our oldest chicken, just turned five. (Of the original four, one was a rooster we re-homed, one died mysteriously in the night, and one had a run-in with a possum. Keeping chickens gets real fast.) The best part of having birds is the abundance of delicious eggs fresh from our backyard, and Nathan wanted to make sure production didn't lag. Chickens don't lay forever - most breeds begin to slow down as they get older, which is why bringing younger ladies into the fold is important. We've landed on an every-other-year schedule, which is working out pretty well. The other reason we decided to get more chicks is because we've been letting the older girls free range in the backyard. Our chicken coop is pretty big but I'm always worried about space and comfort. Seamus, our older dog, didn't appreciate the chickens and would snap at them, so it wasn't safe to let them out in the yard. After Seamus passed away in February, we decided to see how Calvin handled the birds and it turns out he could not care less. I'm not sure if he's afraid or just lazy, but either way he keeps a friendly distance. So why was I reluctant to get new chicks? Because the first few weeks are the most time-consuming. Chicks need a lot of care and attention. You have to keep them inside, under a headlamp. You have to make sure they haven't pooped themselves (pasty butts can be deadly!) You have to clean out their food and water multiple times a day, because they like to poop in it. Mostly it's just a lot of poop. Then again, it's also a lot of cute, fluffy chicks. In the end, the pros outweighed the cons. The nursery. Already counting down the days until they move outside. Over the years, we've acquired chicks a few different ways. 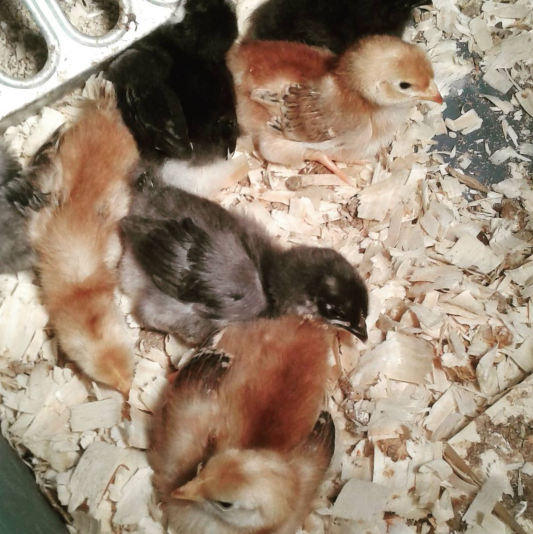 We hatched our first ones with the help of my in-laws, who brought us fertilized eggs from their farm in Illinois. 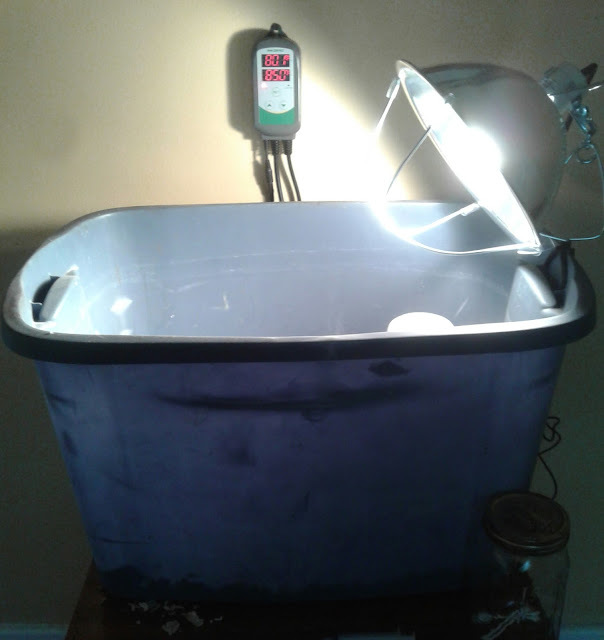 Since then, we've gotten chicks from the farm store, the hardware store, and Craigslist. These little ones came from a backyard farm south of us. The breeders were an older couple who lived down a long dirt road and had quite the operation - rabbits, ducks, chickens, goats, pot-bellied pigs, and catfish. We landed on their ad because, in addition to selling some common, reliable breeds, they also had two silkies. 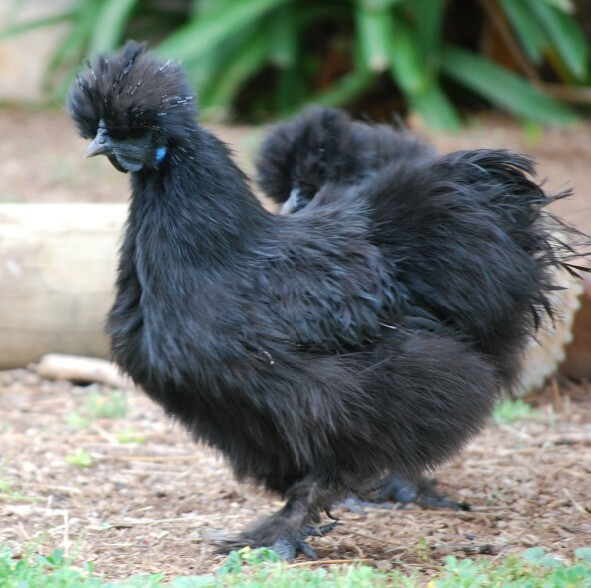 Silkies are ridiculous looking chickens known for being friendly and docile. They aren't the most productive layers (about three eggs a week, in their prime) but when you look like this you can get away with that. 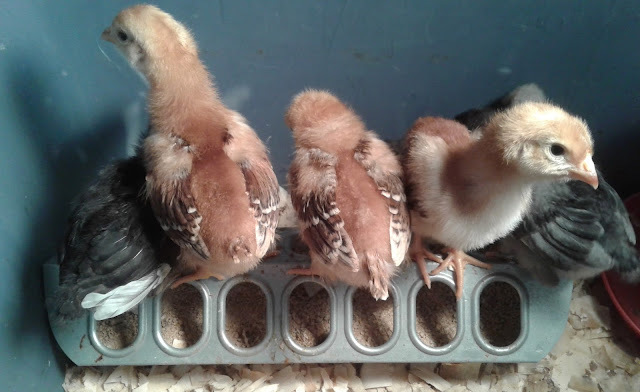 We also got some Rhode Island Reds and two Marans, which are known for laying eggs that are a deep chocolate color. One of my favorite thing about keeping a mixed breed flock is the variety of eggs we get. They come in all sizes and colors, and I can usually tell who laid which egg. Plus I love looking out and seeing the rainbow of chickens wandering through out backyard - AKA "Chicken TV." I can't wait until the new chicks make it to prime time. PS: A tour of our DIY chicken coop & the first chicken I ever hatched from an egg.